Welp. I was typing my VERY LAST SENTENCE ON THIS POST when I hit two random keys on my keyboard and the whole thing disappeared. Thirty minutes and tiny tear later (not really but almost)….let’s try this again. While frequently hitting the “save” button this time. This is an extension of yesterday’s post on simplifying my wardrobe. 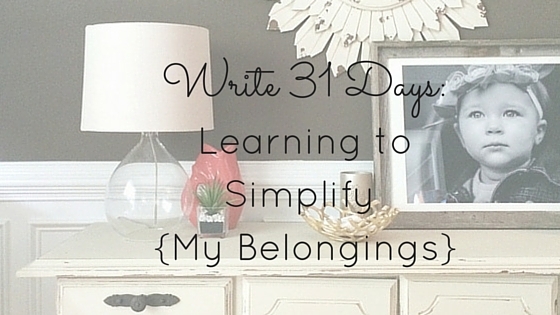 I realize “belongings” is a rather broad scope, but honestly my decluttering and simplification method is generally the same whether I’m going through my kitchen or my paperwork. Here’s how I tackle it all, based on my trial and error while working through the book The Life-Changing Magic of Tidying Up. 1. Realize you have too many belongings. FAR TOO MUCH. You could live with a fraction of the things you currently own. If you have any clutter in your home, you have too much. If you have stacks of stuff in various places, you need a “stuff detox.” And by the way, I come from a long line of “stackers” and it is a really hard habit to break. We stack papers, books, pictures, and boxes right along with all of our good intentions. We plan to go through that pile. We will eventually deal with all of it. Except we don’t. The stack just grows and we move it from point A to point B. It doesn’t take long for us to become so overwhelmed that we just ignore it completely. If this is you, JUST STOP. Grab a pile. Ask yourself why you are keeping every single piece of it. You’ll be amazed at how much can be dealt with quickly or thrown away altogether. 2. Only keep that which you love or that which you must. That which you “must” is a short list and involves mostly paperwork, family heirlooms, and the like. 3. Find a home for everything you decide to keep. If it doesn’t have a home? Yep – it’s gotta go. I have a good friend who says she “hates clutter” and I’ve decided that I want to be that type of person. I’ve found that the more I clear out, the less tolerant I become of junk. Less stuff = less clutter = a cleaner, neater home. That’s just how it works. The reward of the work is exponential. So, go grab a box or a pile and get going! (Start in your closet if you haven’t already, and read yesterday’s post for some tips.) It’s like a good haircut: you’ll feel instantly lighter and wonder why it took you so long to make the cut.